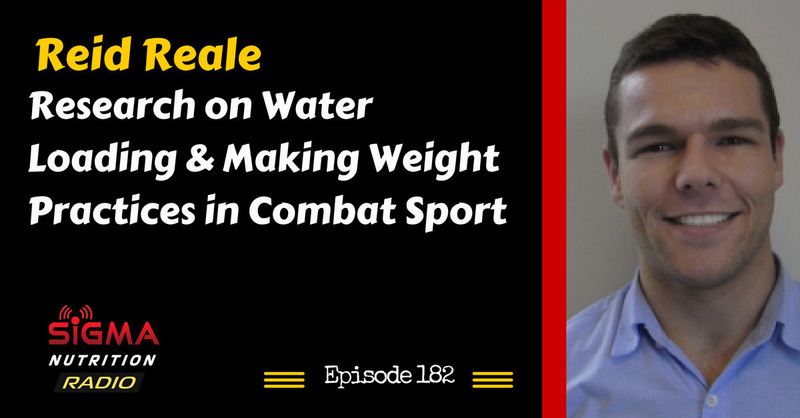 Episode 182: Researcher and BJJ black belt, Reid Reale discusses his research on water loading strategies in weight cutting for combat sports, as well as other methods used to make weight effectively. Reid recently completed a PhD, focusing on weight cutting techniques and body composition of combat sport athletes. This work was carried out in conjunction with the Australian Institute of Sport, where research is combined with helping elite level Olympic athletes. Reid has a master’s degree in dietetics and holds Accredited Sports Dietitian and Accredited Practising Dietitian status with Sports Dietitians Australia and the Dietitians Association of Australia respectively. He won first prize in the “Young investigator award” at the 2016 European College of Sports Science annual congress in Vienna, for his presentation ‘Rapid weight loss in Olympic combat sports’. On the sporting side, Reid started training BJJ in 2006 and received his black belt in 2015 from Prof. Chris Derksen of the Peter De Been lineage. He is an active competitor having fought in hundreds of BJJ competition matches and winning gold medals at every belt level. His most notable and recent achievements include 2016 UAEJJ World Pro Trials Black Belt Heavyweight champion (Sydney, Australia), 2015 Asian Open Brown Belt heavy weight silver medallist (Tokyo, Japan), 2015 Pan Pacific Brown Belt open weight champion (Melbourne, Australia).